The Eurolanche Fan Club traveled to Germany to meet with a legendary Avalanche player. The Eurolanche Fan Club celebrates its 10th anniversary this season, which provides a great opportunity to organize even more events than in the past. Last weekend, the Fan Club organized a trip to Berlin to meet with Uwe Krupp, who scored the 1996 Stanley Cup-clinching goal. It was the second player meeting this season, as Eurolanche members met with Steven Reinprecht in Germany back in November. Six Eurolanche members from Germany, Slovakia and Sweden (originally from Colorado) spent a weekend in Berlin, which began with Friday’s evening game between Eisbären Berlin and Kölner Haie. Krupp’s Berlin lost 1-2. After the game, the Eurolanche crew was welcomed by the team’s Head of the Communications at a press conference and a meet & greet session that followed after the game. Uwe spent 30 minutes with the European fans, answered all questions, gave dozens of autographs and took individual and group photos. He was in a good mood and shared memories of his time with the Colorado Avalanche. Eurolanche members will have plenty of opportunities to win Krupp’s signed photos in future contests. The following two days of the trip were about exploring Berlin, since everyone from the group was there for the first time. Eurolanche members visited the city’s most famous locations, like the Brandenburg gate, Checkpoint Charlie, the Berlin Wall or the Reichstag building. You can view the photos from the meeting and all three days in Berlin in our photo gallery. Krupp was selected by the Buffalo Sabres 214th overall in 1983 after Scotty Bowman discovered him in Germany. He made his debut in both the NHL and AHL during the 1986/87 season and immediately won the Calder Cup. His career in Buffalo spanned for four more season, during which he established himself as the second German-born player to play an extended time in the NHL. He was also the second player from his country to play in the NHL All-Star Game. Krupp was traded to the New York Islanders, where he spent three seasons. During the 1994/95 season, he became part of the Quebec Nordiques organization and relocated with the team to Denver a year later. He suffered an injury in the Avalanche’s inaugural game and returned to action at the end of the regular season. He appeared in all play-off games and scored the Stanley Cup-clinching goal in the third overtime of Game 4 against the Florida Panthers. In 1998, he signed a contract with the Detroit Red Wings, where he was reunited with Scotty Bowman and won one more Cup in 2002. He retired after four games for the Atlanta Thrashers in 2002/03. Krupp has been a successful coach in Germany since 2005. He is the architect of the two biggest moments in recent German hockey history – he was the coach of the German junior team when they were promoted to the elite category and he also led the German national team to the semifinals at the 2010 World Championship, the same year the team appeared at the Winter Olympics. Since 2011, he has been coaching in the German league. 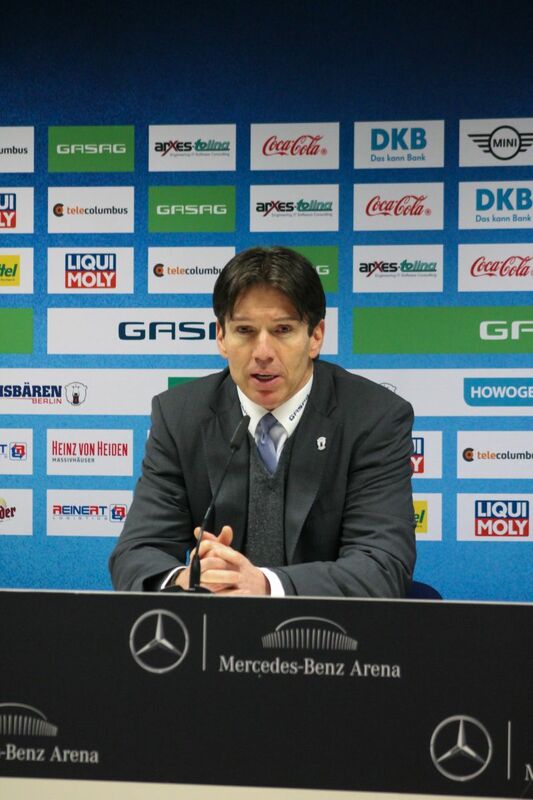 He spent the first four years with the Kölner Haie, after which he moved to Berlin, where he’s been coaching ever since. He was named league’s best coach in 2013 and had the opportunity to coach his own son Björn Krupp in Cologne. It’s also worth noting that Krupp was the tallest player in the NHL for nearly seven years, standing at a towering 6'6'' (198 cm). First question, where is the puck? I think the puck is with Pierre Lacroix. I think I’ve heard the puck somehow ended up with Pierre after we scored the goal. That’s the last I’ve heard of it. If he doesn’t have it, then it’s gone. How do you remember the goal? Were you surprised it ended up in the net? I remember that we played a good game. It was pretty even. There were several chances on both sides, but I did think we had the better chances. John Vanbiesbrouck made some really incredible saves and Patty (Roy) also had to come up big. It was a really good hockey game. Obviously, we weren’t under a lot of pressure – we knew that it could be the clinching game for us, whereas the Panthers had their backs against the wall. If there’s something like a comfortable situation, then we certainly were in one. We knew that we could just play and keep it tight. Can you describe what happened after the game? Were there any celebrations even though it was a game on the road? First of all, I have to say that Florida and their play-off run was like a Cinderella story. I remember that the fans were really grateful. With a win in sudden-death overtime, the game simply ends, just like that. We celebrated on the ice, but there were still quite a lot of people in the arena. They congratulated us and as I’ve said, they were really grateful. It was a special moment for us, but at the same time, you had to respect the remarkable play-off run the Panthers had. They were new to the NHL and had a great run all the way to the Finals. As much as we celebrated, especially with the distance we had to travel, you had to give a lot of credit to the Panthers. What about your day with the Stanley Cup in Germany? I didn’t take the Cup to Germany. I’ve spent the 25 years I’ve played in North America entirely in North America, I didn’t spend much time in Germany, with the exceptions of several summers. By the time we won the Cup, Colorado pretty much became my home, which is why it made sense to spend my day with the Cup with my friends and family in Colorado. It was really nice. Do you keep in touch with some of your former Avalanche teammates? Yeah, I don’t think you’ll ever entirely lose contact with the guys, especially the ones who are still involved in hockey. You see the guys at the draft or the coaches’ symposium. A lot of guys are working as coaches – I’ve ran into Sylvain Lefebrve pretty much every summer. I also saw Joe Sakic and Craig Billington. I saw Peter Forsberg while I was coaching the national team, since he was a consultant for Sweden at the World Championship. Basically, you see the guys everywhere, because the hockey world is a rather small one. It seems that a lot of guys from that team stayed involved in hockey. I’ve also ran into Valeri Kamensky, Alexei Gusarov and Patty, obviously, with whom I’ve been in contact since he became involved in coaching and started coaching the Quebec Remparts. He later ended up coaching the Avalanche, which I think was a great move. It was really exciting to watch the whole situation unfold. We shared a lot of good memories together. I think that the time and success you enjoyed with the team creates a bond. Even when you don’t talk to them on a regular basis, you meet up eventually and within five minutes, it’s like you’re in the middle of the season again. The guys don’t change too much – the funny ones are still funny and the quiet ones are still quiet. We were a really good group and became something like extended family. Do you still do dogsledding? After I retired and started to do dogsledding, I didn’t think I would stay involved in hockey. I really thought that the ranch in Montana and the sled dogs were something I’d keep doing from that time on, but life never happens quite like you plan it and before I knew it, several new opportunities opened up and I’m attending a coach certification program. It’s funny, but you have a lot more time as a player than you have as a coach. While you’re a player, you take care of yourself, make sure that you stay in good shape and that you meet all the requirements to be a good player and do the right thing for your team, but as a coach, you’re involved in everything, in every aspect. Unfortunately, the dogs needed a lot of work. We had to move them in Paris. We had a number of really good sled dogs and we made sure they were put into good homes. I actually miss it. It’s something I did for a really long time and it was a big part of my life, but coaching’s totally consuming, there’s literally no time to do anything else but coach. Do you consider your time with the Avalanche the most successful part of your career? It was certainly the most successful part. I’d also include my time in Quebec, because the Nordiques becoming the Avalanche was a really interesting aspect of my time in the organization. At no other point in my career was hockey as much fun and rewarding as during my time with the Avalanche, but people forget that it’s hard work. Playing in the NHL is a privilege, but the guys all work really hard. 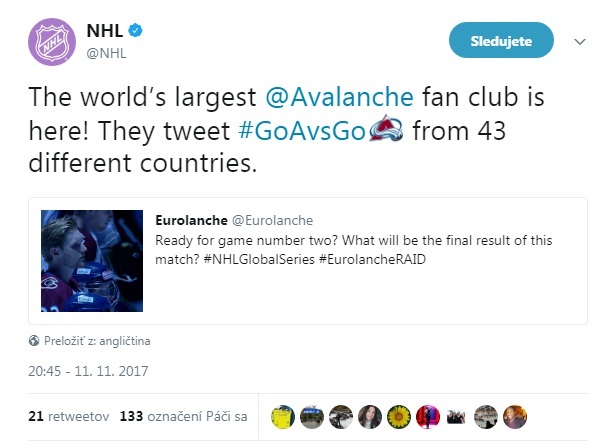 Playing for the Avalanche, for their fans and living in Colorado, which is beautiful, was great. Life was good. Do you have any advice for the current Avalanche team? It’s really hard when you keep losing, because everyone focuses on the negatives. The fans want to see the team win, they want to support a winning team. There are a lot of aspects of running an NHL team. On one hand, they’re going through a really difficult time, but on the other hand, it’s a great opportunity, an opportunity to rebuild your team through the draft if you’re in the position to make a good pick or multiple picks at the draft. If you take a look back on how the Avalanche won their first Stanley Cup, you’ll see that it was thanks to the draft, as the Nordiques had a number of bad seasons. If you ask Joe, being part of the Nordiques was hard. I think that the Avalanche will continue to go through tough times, but the guys that are maturing, for example MacKinnon, Duchene or Landeskog, will come together. There needs to be a group of guys that’ll come together and learn how to win games. You’ve seen how talented they are, they did a great job with Patty behind the bench and now these guys are maturing together and will learn how to win games. You have to lose some games in order to elevate your game and your overall performance to become a successful team. The ’95-’96 Avalanche went through some difficult times while still in Quebec before the franchise relocated and people tend to forget that. The second Stanley Cup-winning team was different, because Pierre assembled a team with the goal of winning it all. The team that won the first Cup was a team that was assembled through the draft and through the Lindros trade. There are different roads to success. I’m still rooting for them, because they’re still my team. I wish them all the best. I would love to see them succeed again. Is there any special reason you wore number 4? While I was growing up, number 4 was the equivalent of what Bobby Orr is to the North American hockey scene, because we had a player like that in Germany who actually idolized Bobby Orr. He took Orr’s number because of that, because he was a player who revolutionized hockey. His name is Udo Kießling and I think his jersey’s in the Hockey Hall of Fame, because he played the most games for the German national team. He was a really special player. When I was 18, he played for the Cologne Sharks, which was the team I grew up playing with. I was able to make my first steps as a professional hockey player next to him as his partner. Obviously, I wouldn’t be getting his number while playing there, so once I got to Buffalo, I used the first opportunity when number 4 became available to change my number from 40 to 4. I also got to keep it while I played for the New York Islanders, the Nordiques and obviously for the Avalanche. It’s a great number for a defenseman and a lot of great defensemen wore it. Even today, when I do something on the ice, I still want number 4. Who’s the most talented guy you’ve played with, either from your generation or from Colorado? That’s a tough one. If I would have to give the puck to anybody that I played with in a tight game and say “win the game for us”, there’s only one guy and that’s Joe Sakic. It’s not that he was the one with the most talent, because we had a number of talented players, like Peter Forsberg and Valeri Kamensky, who was a really great player, but Sakic had a special set of skills. I don’t know how else to describe it, he was an awesome hockey player. He’s an awesome guy, a great person and a great teammate. It was a privilege to play with him and to win a Stanley Cup with him. Were you in the stands when he handed the Stanley Cup to Ray Bourque? No, I wasn’t, but I watched it on TV. He’s the type of guy you want to build a team around. You’ve got to give Pierre Lacroix a lot of credit, because he was able to build a team that was like a family and he treated us like one, too. He was there for every single one of us. Aside from playing hockey, the guys on the team also have to live their personal lives and Pierre helped us go through it. He was a great general manager. He was completely invested in what he was doing. He did everything from the heart and as a player, you felt a connection with the management. It was different when I played for Detroit afterwards, but now, when I analyze it from a coaching standpoint, there’s a lot of similar things both organizations did in order to be successful. But as I’ve said, Pierre was special. He and his wife were the glue that held us together when things were difficult, both individually and as a team. You don’t win unless there are special people involved and Pierre was certainly a special guy. When you look at his history, during his days as a player agent, he didn’t treat the player he represented like clients, but more like family. With time, you look at all that’s happened with a different perspective – the way things were handled and how the team was run. Everything was done with a lot of passion and a lot of heart, otherwise we wouldn’t have had a chance to win the Stanley Cup. Is there a chance you might return to the Avalanche one day? Right now, I’m coaching in Germany. The road coaches take isn’t as linear as those of the players. As a player, you move on when you’re good – from the juniors until reaching the pros. You work your way through. As a player, you have an idea where your road’s going to take you, but being a coach is very different. You have a job, you keep that job for a while, but it’s very time-limited. Usually, another opportunity opens up afterwards, so timing is very crucial. Whenever I was or am in contact with Colorado, I’m generally under contract somewhere and I’d like to say that I’m on a certain quest, on a certain mission. Here in Berlin, we have big goals. There’s a vision – to make the team as successful as it was in the past. That’s something that’s my priority right now. I obviously watch what’s going on there and I’d be honored if I would get a phone call to help out in any form or way. As I’ve already said, it’s not something you can predict so easily. My heart’s over there, so if anyone would ask for my help, I’d be very honored and would do everything to help. Hockey is a big business and you can help out in many ways – player development, coaching, scouting etc. But right now, I’ve got a job here and Berlin is a great place. Was there an arena you hated to play in? Hated is a strong word. Early on in my career, while I was with Buffalo, we had a really hard time winning games in the old Boston Garden. It was a really small building with square corners. The Bruins were really good at home. Also, the old Montreal Forum and the Maple Leafs Garden were tough places to play in.